Norman Lindsay on Canvas is a new concept in bringing the artwork of Norman Lindsay to modern homes. As new homes are built more expansively and with much more wall space than ever before, larger artworks with aesthetically pleasing images are being sought to fill these spaces. The first in this series is Lady and Parrot, originally produced as an original etching by Norman Lindsay, and one that is now one of his most iconic images and typical of an Art Deco/Art Nouveau piece. The appeal of Lady and Parrot spans generations. Norman Lindsay on Canvas images are large – very large. Pictured here is the 79cm x 79cm square Lady and Parrot above a king size bed. This gives you the perspective required to understand the size of these works. 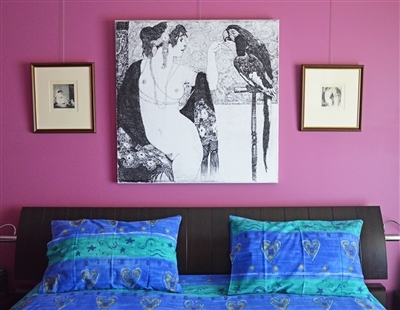 In the bedroom image, to the right of the large Lady and Parrot, is the Facsimile Etching of Lady and Parrot to give you the size difference between the original size of the etching and the larger than life image. Norman Lindsay on Canvas works are priced unframed/un stretched. They are sent rolled in a tube for you (between two and three weeks from when your order was placed), ready to either frame or put on a stretch. They are produced as an archival Ultra chrome oil pigment Giclee print on 360gsm Epson ‘Signature Worth’ museum grade artists’ satin canvas with five coats of UV/Protective satin lacquer. Additional borders and folding guides are added to the front of the image for stretch framing. Two sizes are available, 79cmx79cm square.